Nova Grappler and Dimension Police from the coupon card promotion. 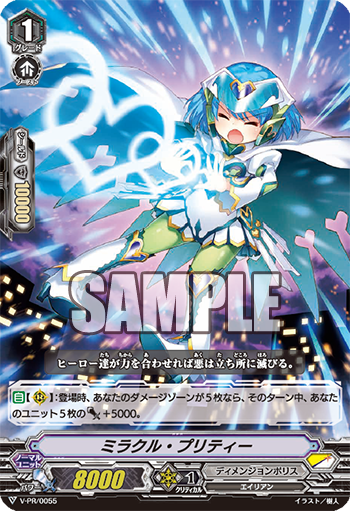 AUTO (RC) 1/Turn When it Stands, if this unit is in the front row, you may have this unit get Power+5000 until end of turn. If you have five face-down cards in your damage zone, it gets Power+10000 instead of +5000, and Counter Charge 1/Soul Charge 1. AUTO (RC) When placed, if you have five cards in your damage zone, five of your units get Power+5000 until end of turn.